Total Run Time: 48 mins. In 1913, early film mogul Siegmund Lubin decided that the time had come to begin producing films longer than the one- or two-reel (10-25-minute) films that were the norm. 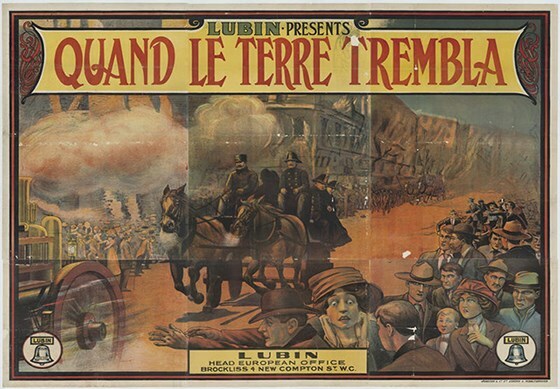 Keeping with his philosophy that “spectacles and disasters” were what audiences wanted to see, he went all-in with his first mega-production, a three-reel film titled When the Earth Trembled, or The Strength of Love, featuring the 1906 San Francisco earthquake and fire as its centerpiece. At a time when the Lubin Studio was producing two completed films per week, an unheard-of four months were devoted to creating the special effects and collapsing sets that would recreate the disaster. Now more than one hundred years after its original release, the San Francisco Silent Film Festival has teamed with EYE Filmmuseum in Amsterdam to restore and preserve When the Earth Trembled and return it to the screen. The restoration was a project of SFSFF and EYE Filmmuseum, including elements from MoMA and BFI. And: The Miles brothers' A TRIP DOWN MARKET STREET, shot days before the 1906 San Francisco earthquake. Courtesy of Lobster Films.